We are pleased to announce that Telefónica O2 Ireland, a leading provider of mobile services and communications solutions to more than 1.7 million customers in Ireland, has chosen Brightcove to support a variety of new online video initiatives. This includes support for a series of highly popular live events, like the recent intimate gig, "A Night in with Westlife." O2 is taking advantage of the wide-ranging innovations in the Brightcove platform to deliver high quality, interactive online video experiences and high quality live feeds for major events. The Brightcove-powered event with popular Irish group, Westlife, was available to fans in Ireland, the UK and Germany. 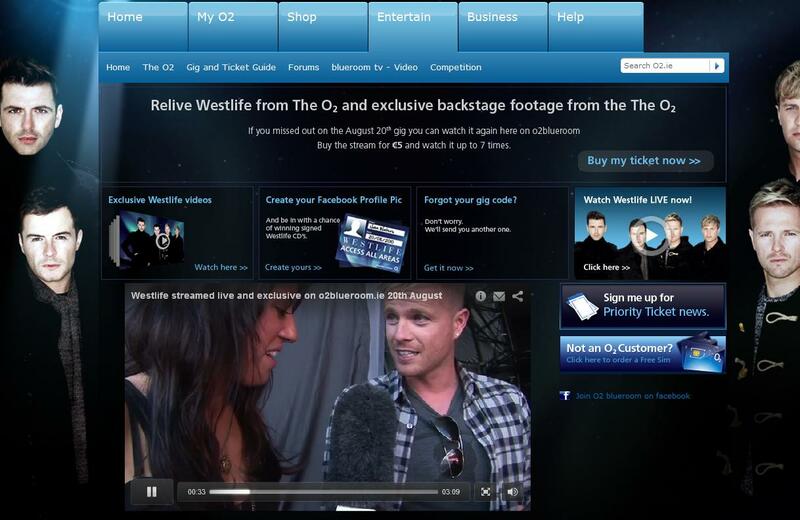 Prior to the event, O2 published backstage video interviews and footage of Westlife to help drive attendance to the main event. Fans were also able to upload videos of their own, as well as participate in cross promotions on Facebook and Twitter thanks to Brightcove's easy integration with third party sites. This is an exciting win for Brightcove and we look forward to supporting more O2 live events and broader video initiatives in the future.